Stir fry recipes are great when you have very little time. I also find that they offer a great way to use up lots of leftover vegetables that have been taking up space in my refrigerator. 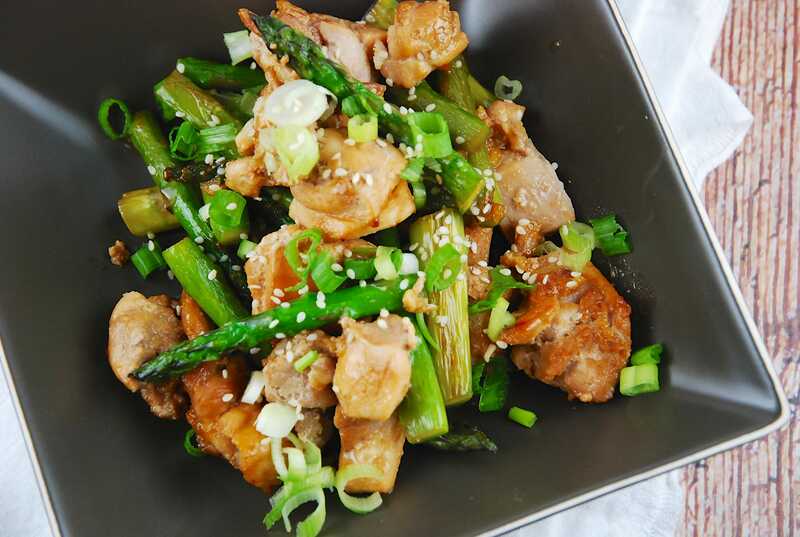 One of my favorite Weight Watchers Stir Fry Recipes is this Chicken and Asparagus dish. The chicken soaks up all the flavor of the marinade, making it incredibly flavorful, and the fresh asparagus is delicious! Each serving comes out to just 5 Points, so serve it with steamed brown rice, Soba noodles, or even over some zucchini noodles. Enjoy! Juicy chicken breast that’s been marinated in a flavorful soy based marinade with a hint of sweet, stir fried with fresh asparagus, this Weight Watchers chicken recipe is a real winner. It’s easy to prepare and makes a great weeknight dinner. In a small bowl, whisk together the soy sauce, garlic, honey, half of the sesame oil, and lime juice. Add the chicken pieces, cover and marinate at least 3 hours. Heat remaining sesame oil in a large skillet over medium high heat. Add in the red pepper flakes and asparagus. Cook until asparagus is tender, but not soft, about 5-7 minutes. Remove and set aside. Remove chicken pieces from the marinade, add to skillet, and brown evenly on all sides, about 5 minutes. Pour in reserved marinade, and cook until chicken is throughly cooked through, about another 5 minutes. Toss in asparagus, and sauté until evenly heated. Garnish with green onions and sesame seeds and serve. This recipe is sooooo good! I’m currently trying to eat healthier. Also trying to drop 25 pounds. Thanks for such a yummy recipe! I’ll be cooking it again soon!